If you asked me what bag at Gucci today still epitomises the past and the present as far as their handbags are concerned, this would be it. Those familiar with the Italian luxury house’s bags of yore will find the bamboo handle familiar, a Gucci signature that’s still keep alive and well under the auspices of sitting Creative Director Alessandro Michele. As simple as it might look, each bamboo handle still has to go through hours and hours of skilled craftsmanship, a single artisan crouched over an open flame as he exposes the bamboo rods to heat, slowly bending them bit by bit before it takes its eventual curved shape. Layers upon layers of a special varnish are also applied to give it that shine, as well as to keep it in an almost pristine condition for years to come. A leather top handle bag with printed snakeskin detail along the flap and snake head closure. The snake is often associated with the image of Lilith, who in mythology is thought to have been the first wife of Adam and later, a demon. The textured snake head has crystal stones set in the eyes. 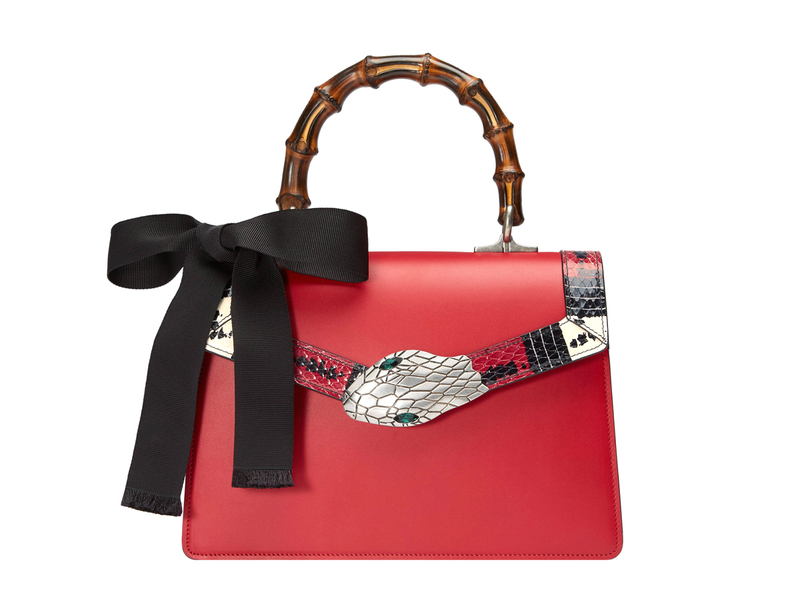 The bag is further enhanced with a bamboo top handle and black grosgrain bow detail.